The Statue of Liberty finally reopened on the Fourth of July, months after superstorm Sandy swamped Liberty Island. A large crowd gathered for the holiday and ribbon-cutting ceremony with federal officials and Mayor Michael Bloomberg. Lines stretched blocks long for the boat, which left from Battery Park in Manhattan starting at 8:30 a.m. Thursday. Rodney and Judy Long, of Charlotte, N.C., were the first people in line for the boat called Lady Liberty. They couldn't get tickets to climb up to the top of the statue, but they were just glad to be there for the big reopening, they said. "It's perfect timing for it to reopen. It's really a symbol for what the country is all about,'' Rodney Long said. Heather and Chris Leykam traveled to the statue from Brooklyn with their three kids: Avril, 7, Delilah, whose 6th birthday is Thursday, and Finn, 1. The family thought it would be great to celebrate Delilah's birthday at the Statue of Liberty. Some repairs to brick walkways and docks are still underway, but much of work has been completed since Sandy swamped most of the 12 acres of the national landmark. 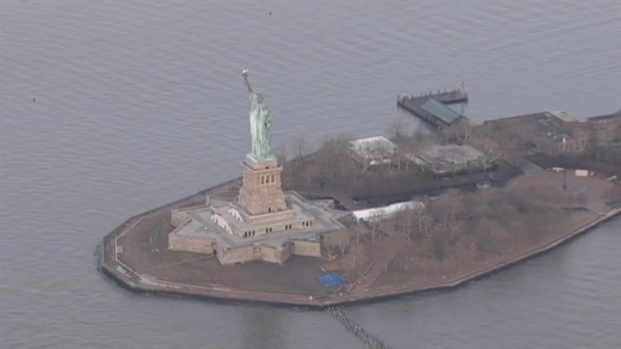 The statue was spared in the fall storm, but Lady Liberty's little island took a serious beating. Railings broke, docks and paving stones were torn up and buildings were flooded. The storm destroyed electrical systems, sewage pumps and boilers. Hundreds of National Park Service workers from as far away as California and Alaska spent weeks cleaning mud and debris. The tiny island was decorated with star-spangled bunting Thursday, but some parts remain blocked off, and the main ferry dock was boarded up. The Statue of Liberty will reopen to the public on July 4, more than nine months after Hurricane Sandy destroyed its docks, security screening system and energy infrastructure.New York Sen. Charles Schumer told NBC 4 New York Tuesday that the patriotic landmark will reopen on the holiday. The U.S. Department of the Interior confirmed the date is set. Parks workers greeted visitors with: "We are so glad to see you!" The visitors said they were impressed. "It's stunning, it's beautiful," said Elizabeth Bertero, of California's Sonoma County. "They did a great job rebuilding. You don't really notice that anything happened." Visitors to Lady Liberty will go through security on lower Manhattan, after city officials criticized an earlier plan to screen them at neighboring Ellis Island, which endured far worse damage to its infrastructure. Officials said Thursday that Ellis Island is expected to open sometime in the fall. The damage to both islands was put at $59 million. New security plans for the Statue of Liberty could leave visitors vulnerable when it reopens July 4th, New York officials said Monday. Gus Rosendale reports.